We previously reported that Sir Ridley Scott, Michael Fassbender and Danny McBride would be attending SXSW to show off footage of Alien: Covenant alongside a screening of the original Alien. The above comes via Beeslo on /r/LV426. If you think that sounds like a scene from the trailer you’re not wrong. Tracking Board clarifies that the crewmember was Billy Crudup’s Oram whose unfortunate encounter we have seen in both trailers. 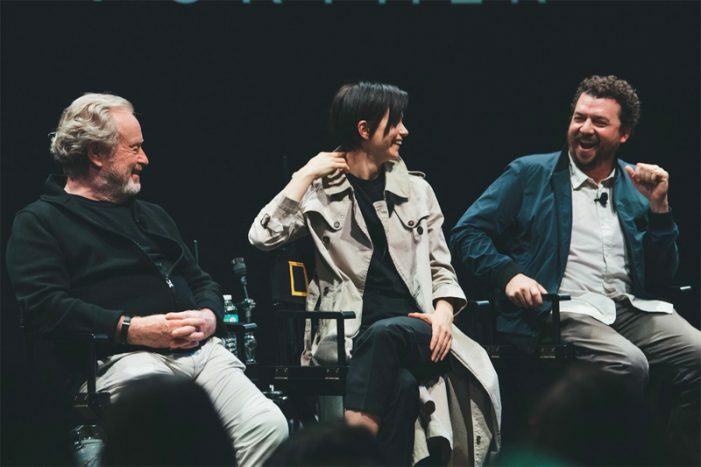 Ridley Scott, Katherine Waterston and Danny McBride at SXSW. Credit: Kats Detroit Team. Judging from the Twitter reactions, the reception to the previews were pretty positive! With just over 2 months until Alien: Covenant’s release, we wont have to wait long to find out! Yeah I wouldn't rule it out, if Seagers says we're edging into the fully fledged Giger stuff I'd like to think that Scott would embrace it. It's odd on RS’s part. If you think about it. He stuck to most of his original ideas about the Alien in Prometheus: The Alien being a bioweapon, the Derelict being a battle wagon. Yet the idea of the Alien getting it's biomechanical look from the Space Jockey was thrown out, or at least, contradicted, with the Deacon. Not if the Engineers don't end up actually being the Space Jockeys. I understand that as far as we're concerned now, Space Jockeys = Engineers but we can cling to hope, right? Shawsbaby makes a good point, I mean I'm hoping for some biomechanical wonderland portrayed at some point; alive and erotically charged, but I think it should just be shown and not explained away, that's if such a thing would ever come to pass, mind you, but I think it'd be wise to just leave enough to make some strong inferences regarding the ultimate origins of the biomechanical elements and leave it at that. Scott seems intent on leading up to it however. It's not unreasonable of me to hold onto hope that we'll see an entire Giger-esque landscape or world? I of course don't disagree that it's possible to achieve some expository complexity in a script, but I think there's a lot of wishful thinking that there's more to what we've seen/been told through leaks than there actually is. My hope is that they went for more direct explanations as a way of healing some of the narrative gaps that Lindelof was all too eager to create in Prometheus, rather than taking the path of least resistance to making a sequel that pleased those who just want to see great Xeno horror again while having a superficial connection to the Prometheus storyline. I for one am still very, very excited about A:C and have enjoyed what I've read. Would I have personally, as a writer, come up with a different take on this sequel? Absolutely. As a fan of the series, am I eager to see what's sure to be a lot of fun and scary, if not all that smart or game-changing for the franchise? Absolutely. I think much of what people are hoping for in terms of mythology and explanations would be awfully cumbersome in a film script, and I think a lot of people will be disappointed that what's in A:C is either way more simplistic or largely left unsaid. Perhaps supplemental materials will help with some of this, but there's a lot of intricate imagination happening on this forum that, while intriguing, wouldn't play especially well on screen. I understand your points. But its just a bit of harmless fun. I don’t think people, I know I’m certainly not, are really expecting Covenant to match up to some of the more complex fan speculation. I don’t necessarily agree though, that some of these ideas wouldn’t be achievable on screen. Part of good writing and film making is the ability to express complex ideas in easy to follow ways, that even a general audience could understand. Unless their trying to be deliberately ambiguous to create mystery, its normally just lazy writing why ideas aren’t fully fleshed out on screen. Lets hope Covenant doesn’t fall into the latter category. pretty certain , like 100% that the original Alien gets its biomechanics aesthetics from growing and bursting from the lv223 jockey whilst he was fused with the pilot chair . the dorsal spines on the BIG CHAP perfectly match the exact same exhausts coming from the base of the jockey chair. Its funny you say that. From when I first saw ALIEN i had been drawing a comparison b/w the FACEHUGGER and the BREATHING APPARATUS on the JOCKEY's FACE, and that never came to pass in any way. For a while, after PROMETHEUS, I was speculating that at some point David or whoever doesnt want that Space Jockey to fly off, would infect the Pilot chair's mechanisms and breathing apparatus with the Goo, thus fusing that pilot in the suit with the chair and causing it to create the Biomech features in not just the Alien but the entire ship. Certainly going to be interesting to see how they pull off bringing the Giger elements back into play in the future films. Considering the Xenomorph is a descendent of the Deacon and the Deacon shares the Xenomorphs ability to assimilate the characteristics of it's host; as demonstrated by its humanoid appearance. Then to be consistent to the idea of the Xenomorph taking it's biomechanical characteristics from the Space Jockey, the Deacon really should have been a biomechaniod. All this makes me think RS maybe abandoning the idea of the Xenomorph getting it's biomechanical characteristics from the Space Jockey and heading down a different path instead. But I hope that's not case. He did say that the origins aren't completely made clear, or something to that effect, which is interesting. Didn't Wayne Haag allude to the creation of the creatures in Covenant may be ambiguous and not so on the nose? I've got to go back and re-listen to the podcast episode. If I recall correctly, Wayne was just hypothesising, just like we do on here! I think that like PROMETHEUS, we're maybe supposed to see this reflection, when you look for answers to these questions. It's like poetry, it rhymes! David is really going to create the Xenomorph, isn't he. he'll jut be re-creating a pre-existing lifeform. I was just talking about this elsewhere, but I thin RS means to get us thinking about what it means to 'PERFECT' a created lifeform. I still think they should leave it a mystery. I.E. David "created" (quote endquote) the xenomorph (or did he)? according to leaks are going to survive. I'm not surprised that they advertise movie together. In my ideal fan-fantasy, yes, I would prefer the Alien to of been created by a Giger-ish Space Jockey or another more advanced Giger-like race. David using the black goo to perfect the neomorphs. I’m certainly not going to write off a film that I haven’t seen yet, just because a key idea doesn’t align to my own personal expectations or fantasies. So like you, I’m just going to accept things and hope we get a good film. The franchise could certainly do with one. In the context of the movie, I won't mind if David's tentatives are not a real success (which means he can't as of yet come up with the classical xenomorph or rebuild it if we think about a preexisting creature). In general, I find the idea expressed by Scott strange. From a naturalist point of view, we humans are but machines. Once you think there is not an ontological gap between humans, the other animals, and the idea of very advanced AI, the only way to agree with Scott, I think, is to say we will not be able to make AI advanced enough (or self-improving enough) to attain this goal. About the movie, I think it's plausible to think that there could be another creature (or creatures) as surprises in it. However I'm more interested by the science-fiction stuff and the mysteries not yet revealed in the trailers (and I hope TV spots or other things won't spoil them before the release). But I'm sure after the alien has cleaned a planet if the Engineers leave it for a while it will be ready to seed again? Who knows, maybe a thousand years is nothing to the Engineers. Prometheus shows that their hypersleep devices can let an Engineer live in it for at least 2000 years, or that the modifications the Engineers have made on themselves (the suit, etc.) can produce that effect (or let's say it's a mixture of both). As for the idea of the "perfect organism", as of now, I still think it's a bit odd idea concerning the Xenomorph. A "perfect killer", I would understand more. If David is truly linked with the creation or return of the classical iteration of the Alien, it's logical and symbolical that Ash be admirative in front of the creature, I guess. if you just turn the original space jockey pik 45' to the right you can see what I'm talking about . like some have suggested in other posts. Perhaps that theory that David is merely recreating the Alien has some credence. Which would mean, that somewhere in this mythology, is an even more deadly, scarier, meaner Alien, we have yet to see. While David didn't create the Eggs, the bio-mechanical part is going to come from him f**king with them. I'm not sure how I feel about this probably being the direction they're going in. I would really find it interesting if this universe established that the black goo, and thus the xenomorph, is a representation of evil in itself throughout the universe. The engineers found about it, possessed and worshiped it, but everything just went plain wrong with them. The xenomorph is ancient, as old as the universe itself. David, as many of you in this forum has suggested, is just trying to recreate something that is older than many of us can comprehend. Surely the Xenomorph itself isn't evil though? It's just the "perfect organism" a perfect killing machine, an apex predator, top of the galactic food chain so to speak? It always reminded me of what everyone learned from Jaws about the Great white shark at the time... How the shark was the ultimate predator and how it never sleeps and keeps,on moving and eating! It had hardly changed over millions of years (alligators and crocodiles are much the same) and I think the alien is in a similar vein. The Xenomorph isn't evil its just an animal.... Which happens to kill everything! The problem that should have been obvious to Ridley Scott is that if the Aliens are meant to "clean up" planets of all the indigenous life...how are the Engineers supposed to start over considering they would be in worse shape than before with all the Aliens running around? Didn’t RS always like the idea of the Alien having a short life span? So I guess if that were the case, then it would just die out after it had done its thing and the eggs would go into hibernation without anymore hosts to infect. The Engineers move in and remove the eggs and start over again. I was thinking about this today... Does the alien eat and therefore leave waste? And what about its lifespan? Maybe the alien does have a relatively short lifespan? We're still a couple of months out from Alien: Covenant arriving in Irish cinemas, but a lucky few got a sneak peak of early footage of the movie this weekend in the SXSW festival. While it can be easy to impress fan-boys with well-cut-together footage that might not represent the finished product, the reaction from what folks have seen so far has been nothing short of staggering. Oh, and terrifying. Absolutely terrifying. Meanwhile, the peeps at The Verge wrote a long (and slightly spoiler-y, so beware) review-of-the-preview, but the choice line has got to be: "If the footage screened was any indication, the tone of Alien: Covenant is full-on, breakneck horror, taking what the original film did and amping it up by a factor of 10." While we try to calm ourselves down at the thoughts of how great/scary this movie is going to be and how we're not sure we can wait til 12 May for it come out, here's a very unnerving look at how Michael Fassbender's new character is made, with Walter coming with a very different accent to the android David from Prometheus, and what looks like an even glassier, more sinister blank stare. I know this for a fact because there is a beautifull painting of one on the ceiling of the urn room . So, basically, the idea is that - the resulting being from the fusion of an artificial and biological mind, has combined to incorporate all of the perfect mathematically-aligned elements to form the ideologically-pure and structurally-flawless genetic makeup of the Xenomorph? Does David find some sort of 'universal algorithm' hidden within the framework of spacetime that unlocks the 'blueprint' for this so-called 'Xenomorph'? Is he talking about two sequels to Alien? To Covenant... He already said that Covenant 2 is being written and will go into production as early as this year or beginning of next year. I was under the impression he already said we would be getting two more sequels to Covenant. God, that would be awesome if it went into production this year. Doesn't look like we're gonna have to wait half a decade for the next installment. Yeah, the report was just about the footage they were shown. That was just the initial neomorphs. it makes sense the neomorph attacks early on are CGI, they are small or smallish at this point. But we know there are practical effects, and artists performing movements etc for (presumably) larger later attacks as previously reported here. The report I must have been misleading. Or maybe he was just talking about the scenes that they were shown? "Why is that you think?" I hate to hear that the aliens were totally created in the computer, but in the shots I've seen they look damn good. Hoping some of this footage will be leaked online. Needing more hosts for his creations, David lures the Covenant, by using a communication beacon Shaw recovered from Vickers life boat, before leaving LV-223. Because the company thinks the SOS is from the Prometheus, its rated as high priority. And the Covenant is then redirected, Nostromo style, to investigate. Apparently it's a garbled holo-recording originating from the crashed derelict that the Covenant receives. When McBride finally manages to decipher it, it turns out to be a hologram of a sick-looking Shaw singing a creepy/eerie song. I guess you could explain it away with her going stir crazy or delirious from sickness. But If that’s true, it would certainly be inconsistent to Shaw’s behaviour from Prometheus. After all, she was willing to sacrifice everything to stop the black goo from getting to earth and even left a warning message to stay away from LV-223. So knowing Paradise is contaminated with the stuff, why would she risk bringing other humans there and spreading the infection back to earth? That’s why it made more sense to me, that it was David. That was from test screen audience member Sargadoa who has been proven so far. Apparently it was David who sent them that holo-recording of Shaw singing. So I don't think it was actually Shaw knowingly luring them there. Just David manipulating her. that the Neomorphs are an existing species from the Engineer's homeworld, and the Deacons are the Engineer's attempt at weaponizing them. The xenos are David's take. Ah! I don't think it's that big of a surprise. People have suspecting this for a long time now. Ha. Well perhaps Ridley and co. (and the marketing folks) know there's nothing terribly unpredictable in this film so they might as well just try to entice people to see what's there. I am pretty surprised they'd show so many key clips. The David/Oram one seems most revealing of the movie's secrets. What are your thoughts about letting so much out there, Hicks? We've already seen it in the trailers so I don't think it's that much of a spoiler now. I wish we hadn't seen so many death scenes in the trailers but that's par for the course these days. I'm speaking more of David's conversation with Oram. This clips seems to directly explain what he's doing and how. In some ways it's equivalent of showing a crowd a clip of David tell Shaw she's pregnant and then showing her go to the medpod to remove it. Should be a super exciting moment for the audience and it has been spoiled two months ahead of time. So far, the clips all showed beats familiar to fans of the long-running scifi horror series, however, the third one harbored the most morbid twist. In it, we saw Captain Oram talking to an android played by Michael Fassbender. However, this wasn’t the newly revealed Walter model. It’s David, the android last seen in Prometheus, who explained to Oram that he’s become something of an amateur zoologist. As the camera lingered on dissected specimens, David revealed he’s been studying the xenomorph. He explained that he’s mapped how insectoid carriers burst from spores to infect hosts and create hybrid lifeforms. Davis spoke admirably about the adaptive qualities of the xenon as he led Oram to a subterranean chamber filled with the iconic Alien egg sacs. Oram asked about the status of these sacs and David replied that they’re “waiting for mother” and assuring the human they’re “perfectly safe, I assure you.” The flaps of one sac opened, showing motion behind a cloudy membrane. Oram leaned over the opening to peer inside and a face-hugger leapt onto his head. David watched impassively as Oram struggled and died. it still remains to be seen what precisely David has been doing. That io9 summary could be red to suggest that David has studied the Neomorphs and improved on them. Too bad. It's perfectly clear now that the franchise is well and truly f**ked. At least the Hishe, the Honest Trailer and Cinema Sins videos will be fun to watch.